So this is when it starts to get hard, because life was just moving along so beautifully. Nana came up to watch Eric and Christina's kids while they went to Costa Rica. 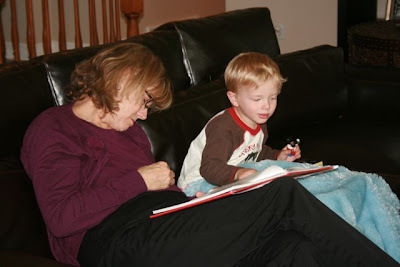 We stole her for the first day, and she "read" to the kids, just like she used to "read" to us. And there we sat, laughing and talking and loving, and never once thought there would be loss so soon ahead... I guess that's how it should be. 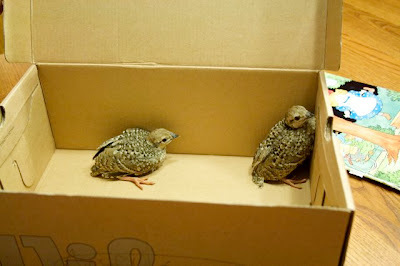 When I put Sophie to bed, we found baby chukars in her window well with a cat hanging out at the top, trying to decide how to catch the babies for dinner. We shooed away the cat, pulled out the chukars who jumped through Sophie's screenless window and explored her bedroom. Then we found the loudest chukar mommy outside and opened the box in her general direction. I like to think they made a beeline to their birdie mom and lived happily ever after. You guys have a lot of animal adventures. Didn't you have a family of foxes or so under your trampoline last year? ?